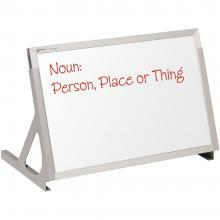 This desktop dry erase board is double sided featuring hook and loop fabric board on the opposite side. Snap on legs allow you to switch surfaces easy. These removable legs also allow this dry erase board to be stored easily, using minimal space. The dry erase board surface is magnetic, providing additional functionality. This desktop dry erase board is a great teaching solution for teachers with limited floor space and ideal for displaying on a desktop or table-top.